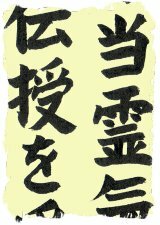 The Reiki precepts, or Reiki principles, are the very foundation of Mikao Usui’s system for self-healing and spiritual development. The story goes that Dr Chujiro Hayashi – student of Reiki’s founder, Mikao Usui – gave all his students a copy of the Reiki precepts and a photograph of Mikao Usui, and we thought that it would be nice to do something along these lines for our own students. So we contacted talented Japanese calligrapher Eri Takase, asked for her help and she brushed for us the Reiki precepts in Japanese calligraphy. We give all our First Degree students an A4 copy of these Reiki precepts, printed on heavyweight ‘linen-effect’ ivory card, and we can now offer you beautiful high quality prints of the Reiki Principles, too, in A4 size, A3 size and as a download that you can print out onto the paper of your choice. A small section of the print is displayed above. Eri Takase is a Master Calligrapher – a “Shihan” in fact – and is ranked as such in Japan’s most prestigious calligraphic society, the Bokuteki-kai. She has won several national competitions and her works have been displayed in the Osaka Museum of Arts. We can offer you a download of the precepts – held as a PDF file – for you to print out onto pretty paper of your choice. The pdf file is A4 size: 210mm x 297mm. This item is GUARANTEED so if for any reason you are unhappy with it, we will provide you with a full refund. Alternatively, we can offer you a print for you to frame and display in your home, your treatment room or your Reiki teaching area. The print is in A3 size (420mm x 297mm, 12.4 ins x 17.5 ins), it is printed on heavy 260 gsm ivory card with a linen effect so that the print resembles the linen that the precepts would have been brushed onto, and it will be posted to you in protective packaging. It would make a lovely gift for another Reiki person. This item is GUARANTEED so if for any reason you are unhappy with it, return it to us for a full refund. If you would like to give the A3 precepts prints as a special gift to your students then we can offer them to you in bulk at a reduced price. We give them to students attending our Master/Teacher courses. You can order a set of four prints for only £24.99, which is less than half price. The prints will be posted to you in protective packaging. This item is GUARANTEED so if for any reason you are unhappy with it, return it to us for a full refund. We have produced A4 size copies of the Reiki principles, again on thick 260 gsm ivory card with a linen effect. These are ideal to give as gifts to all your Reiki students at the end of their course, or as gifts to your Reiki friends. We are offering these to you in bulk: you can order a set of twelve A4 prints for only £12.99. The prints will be posted to you in protective packaging. This item is GUARANTEED so if for any reason you are unhappy with it, return it to us for a full refund. Here you can read further testimonials from people who have purchased our Reiki precepts prints.